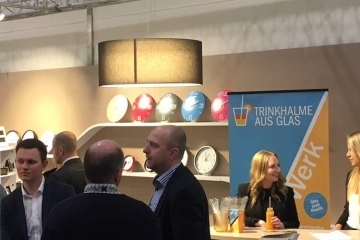 It was with a good feeling, many interesting talks and positive feedbacks on our new products that the TFA team drove back home from the leading European trade fair for promotional products – The PSI 2019 in Dusseldorf. The sustainable drinking straws made of high-quality SCHOTT® glass are manufactured entirely by our TFA glass expert in our factory in Wertheim. The visitors were able to try a new and pleasant drinking experience with GlasWerk straws by tasting the delicious smoothies offered. The response of the trade fair visitors was consistently positive. Again the colourful CUBE TIMER has magically attracted the visitors. No wonder, as no timer is easier to set and people just couldn’t resist but to try it straightaway: one turn to the chosen time and the countdown starts. The CUBE TIMER is also an ideal product for advertising thanks to its appropriate varying countdown times and the different colours available. The latest LED technology paired with radio-controlled time and a surprising design in wood look make the product an eye-catcher. You can almost speak of a renaissance in the VISION window thermometer. Many customers value its quality and the fact that it is easy to use, as well as the ability get logos and advertising texts attached to it. Wall clocks are particularly prominent and striking as advertising media. TFA specializes in this field and also offers full-surface printing of dials. We look forward to the next PSI in 2020! We have exhibited at this leading trade fair for many decades. It is a fixed date in the TFA’s trade fair calendar.